Everyone who knows even a little about Istanbul knows about the markets. The most famous of these is the Grand Bazaar in the old city, but really all of Istanbul is a market. For centuries people have traveled here and traded, bringing goods from near and far to visitors from near and far. Today, Istanbul retains it's market place tradition, and holds proudly to the old ways. Not only do the original market halls and bazaars still operate, but nearly all of Istanbul is a chance to buy and sell. On the streets someone is always selling something; tourist booklets, chestnuts or mussels from a cart, a seat at a cafe. The Grand Bazaar is nearly always crowded with people from many places as well as locals from around the corner. All that selling and all those people can be intimidating! I found it best to approach the markets with an idea in mind of what I might want. Then when vendors approached me, I could be clear about what I wanted and be clear with them about what I was not interested in. A smile and no thank you suffice for a shop owner beckoning me into a shop with wares that do not interest me. However, sometimes, for things I might want, I will engage with the salesman. They are friendly, even kidding, "Can I help you." And when you say "No thank you" they say "Can you help me by spending your money?" We all have a little laugh. The key for me is to make it a friendly interaction. Salesmen have the "gift of gab", they are good with people and easy to connect with. I look at their goods, if they are for me, I might offer 1/2 of what they say is the price and negotiate from there (there is less bargaining on food and spices our guides tell us) If I get a fair price, I'll buy, if not I will leave. If I'm not interested in their goods, no matter how friendly and attentive they have been, I leave with a friendly thank you! I really enjoyed the markets and engaging with the salesmen, and I don't think I bought a single thing I didn't want! The Main Street of the Bazaar is filled with gold shops. I learned from our guide that many people give gold as gifts for life events such as children's birthdays or weddings. Some people also invest in gold jewelry rather than a stock market. Many families buy gold in the markets for these reasons. Lots of people think of Turkish carpets when they think of the Grand Bazaar. Most folks traveling don't have room in their carry ons for a carpet! But they will ship. Also, several salesmen and a fellow traveller told us that most shops can fold a small rug to fit in a checked suitcase. That means you'd have to either also buy a new suitcase, or dump your clothes in the Bosphorus! Of course, like all shopping, you really have to know your product and do your research before you buy to be sure you are getting what you think you are. My husband and I admired a beautiful silk rug, woven in Turkey. I knew from the get go, I was not in the market to buy a rug, but I enjoyed viewing the rug as an art piece and asking the salesmen a bit about it; how it was made, and where, how much it would cost. Of course after 10 minutes in his shop, we had to break his poor salesmens heart and tell him, no we would not buy his rug, no matter how beautiful, but that we appreciated his sharing it's beauty with us. As a former salesperson myself, I don't see it as wasting his time because I know the rule that you need 9 "no's" before you get a "yes!". So my "no" gets him one step closer to his goal! Our guide let us off at Gate 1 with plans to meet an hour later. My husband who has a great sense of direction promised to remember our turns and help us return. But of course we got turned around and soon, we couldn't find our way back to the Main Street (a wide boulevard inside lined with mostly gold shops) Luckily, all the salesmen speak excellent English and are very helpful. "Left, right, left" one told us and he was exactly right. In addition to excellent English, nearly every shop will price your goods in whatever currency you have in your pocket, and take credit cards. Though the best bargains happen when you offer cash! Another major market is the Spice Market. This one is smaller than the Grand Bazaar, but similar in terms of customs. 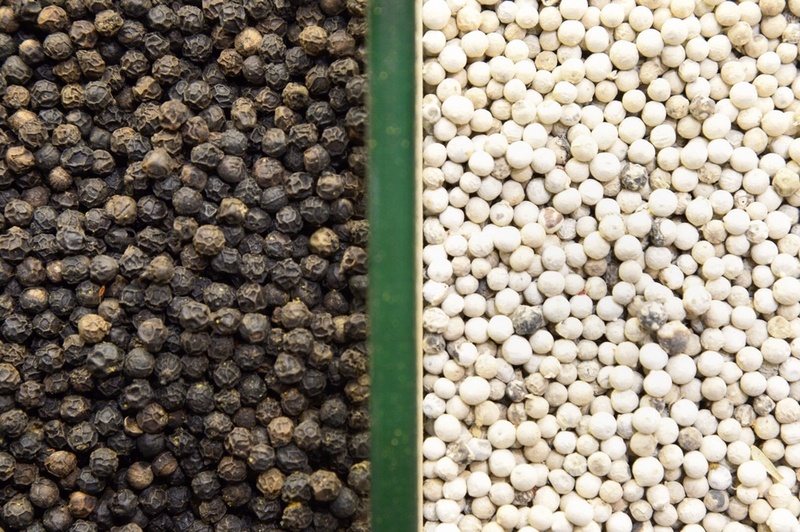 The only difference is there really is not bargaining for spices and foods (with lower margins) unless you are buying in bulk. The Spice Market is called the Egyptian Market by the locals because of course it was the marketplace for Egypt and other far eastern sellers to sell their spices to western traders and visitors. To me both markets had similar "tourist" items as well. If you decide to buy spices, you can buy the whole corn or clove and a mill to grind them yourself, or buy the whole spices ground already. You can also buy spices ground and mixed for easy additions to food. This is for lazy cooks like myself; I ended up with meatball spice and something fun called "mother in law chili", a super hot chili mix meant to discourage your MIL from visiting at dinner. Being partial to hot chili, we bought this one, as much for the fun name as for the hot taste! All of these are vacumme packed so they sail through US, Euro and Canadian customs- however Aussies and Kiwis know they won't be able to take these back no matter how they are packaged. In addition to spices, there are nuts, dried fruits and teas as well as the famous Turkish Delight (a candy made from honey, starch, pistachio and fruit or chocolate) that is for sale everywhere! I have to admit, I wasn't "Turkish Delighted"- I generally like candies, but this didn't do it for me, but it's worth a try! Yours truly with my spice seller, but no Turkish Delight for me! A fun place to check out is the Pet Market to the left of the Spice Market. This is a fun place to people watch because the stuff sold; birds, pet food, plants, seeds, bulbs and and exotic pets like baby alligators, are not really appreciated by customs officers in too many places! However, there are also buckets of leaches for sale, so you could do a little blood letting in your hotel before you leave! Ok, so maybe not! But it's a great place to see locals shopping, but of course there are far fewer English speaking salespeople here. The local doves thought the pet market seed stalls are a great place to sample the wares. Did I mention food? Like most big cities, someone is selling food on nearly every corner, and even places where there is no corner at all! We enjoyed the famous kebap. There were two types; sis kebap, which is grilled chunks of meat, and doner kebap, which is huge stacks of meat seasoned and grilled on a vertical brazier, then shaved thinly with a knife (or in busy places with a power saw) and stuffed between bread or rolled up in a flat bread. It's a great, affordable street food (about 7 TL) and available almost everywhere. So you've got all these salesmen selling to locals and tourists, and then you've got salesmen selling to salesmen! Many shops have a sole propeitor, or the salesmen don't want to step out and miss a sale, so the tea man sells them tea! They call to order on one of several hotlines into his tiny kiosk (with room only to stand next to his huge cappuccino machine) and he makes their teas and coffees and has his helper deliver them to the salesmen in the markets. So what else can you buy? Well, this weekend is Eid Al-Adha (day of sacrifice) Each family (or several together) buys a sheep and sacrifices it and then gives the meat to the poor. During our wanderings through an ordinary neighborhood in the Old Town with our guide, we came a cross another interesting market. A temporary sheep market set up for the holiday! The sheep were packed in a temporary pen set up in a vacant lot. The fellow in the suit jacket was the broker. The sheep had markings on them to indicate which farmer provided them, so the broker could keep track. Men from the neighborhood kept arriving and would choose their sheep. Two young boys would grab it by the horns and drag it to the van where they would deliver it to the yard of the family who bought it. It is quite a sacrifice too! On the day we were there, a ewe was 600 euro and a ram was 800! When we saw Istanbul from the air, it was clear this was a crossroads, a narrow spot where poeple move from one place to another. On the ground, seeing so many markets and salespeople showed us that this crossroads is the perfect place to sell ANYTHING! With our guide book, and a local Turkish beer, we are fortified to explore Istanbul! We arrived in Istanbul this morning. We've read our history and guide books and we know that Istanbul sits at a crossroads of Asia and Europe; a way station and meeting place for the 3 continents. Flying into Ataturk Havalimani Airport in Istanbul this is evident when you see from the air that Istanbul is a narrow peninsula surrounded by the Black Sea to the North (we had just sailed down the Danube, almost to the Black Sea on the AMAPrima) and Marmara Sea to the South, with the Bosphorus splitting the city into its Asian and European sides. If you want to travel by land- this is clearly the path of least resistance, but also a choke point! Looking a large map, it's clear to see that the easiest way to go East to West or West to East by land is to go through Turkey and cross the Bosphorus. This is how peoples moved for migration and trade routes since ancient times. 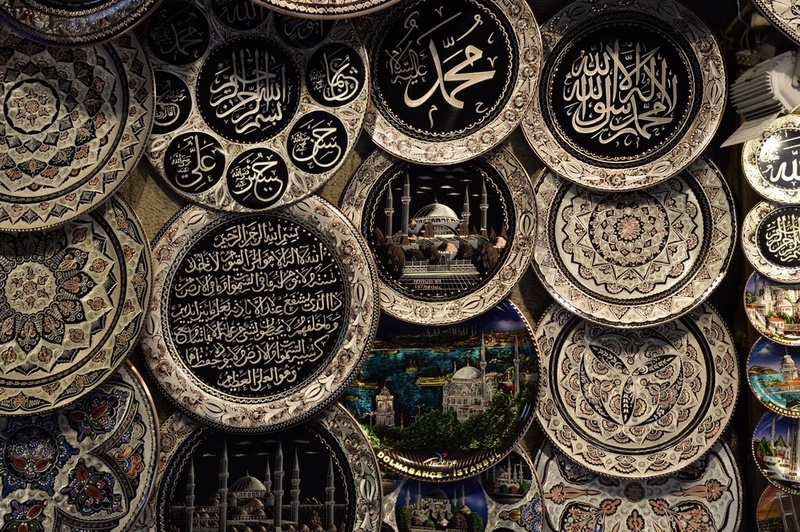 Istanbul was a place where people pass through, but also where trade commences. My first impression is how clean, bright, well landscaped and just how huge, and very busy this city is. I'm also surprised by how many huge Turkish flags fly here. There is a lot of local pride. Taksim Square; which is actually round with not one but 2 huge Turkish flags flying. I wasn't surprised to see that it is still a cross roads for humanity. People are here from every corner of the globe; women in burkas from the Mideast carrying Michael Kors bags, dreadlocked youthful European backpackers, a Chinese couple just off the train (who look like newlyweds and get suckered into the "shoe shine" scam right outside our cafe window. *see below for a description) middle aged Americans (that would be us) and 20 something girls in belly shirts with pierced navels. Even the waiter at the cafe can't sort our where everyone is from- he guesses that Jeff is from Australia. Jeff tells him "close" and then explained he was from Boston, USA. We all had a good laugh over that! But I was surprised at just huge this city is and and just how MANY people are here! 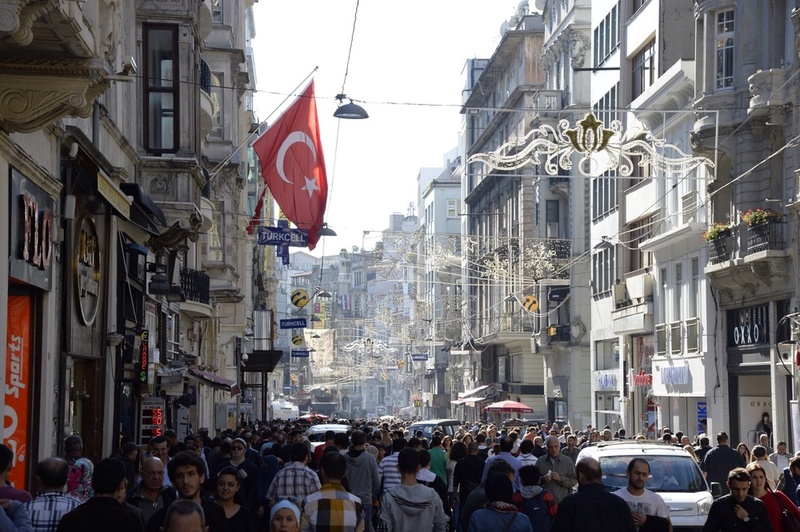 At 3 PM on a Tuesday, Istiklal street, the main pedestrian shopping boulevard in the new part of the city, is teeming with so many people that it makes rush hour in my own city seem like a bank holiday. So many people, from so many places, so many stories. The saddest are the newest arrivals; tiny Syrain refugee children begging on the streets, singing in their little voices, hoping for people to notice them and give them some coins. Our guide tells us 500,000 have come to Istanbul recently. This is an amazing place to people watch, a fascinating display of global culture and commerce...and that's just within walkin distance of our hotel...over the next two days we will see far more of the city with our guide Meli. Our concierge here at the hotel sent us to his favorite spot for lunch, not an hour after landing (well ok, it was more than an hour because it tooks us an hour to cross town in our van because of the traffic- but let's say within a few hours) He walked us to the revolving door with only one warning "if you see a shoe shine boy and he drops his brush, just ignore it." We didn't have time to wonder about this before we had stepped 10 steps out of the hotel and a shoe shine boy passed us dropping a shoe brush as he passed. He expects naive tourists to say, "hey, you've dropped your brush!" and then they pounce with the hard sell to "shine your shoes" (the Chinese fellow had sneakers for heavens sake but once he picked up the brush, the tout was on him brushing his Addidas like they were Bruno Magli's.) Of course all this attention ends with the tout expecting a "tip". In the case of the poor couple we saw targeted; even his young wife came over realizing they had been had and decided to get a picture out of it, but another shoe shines tout started in her shoes! The best advice we got was "ignore them", which is exactly what we did when the brush fell at our feet. We sidestepped it and felt proud that just hours in, we were no longer newbies in this huge complex city. "If there is a doctor onboard, please identify yourself to a flight attendant"
Ah, The joys of air travel in economy. I promise I'm not going to make this a negative blog, just to get laughs, (and not just because there is no laughing permitted in economy) but when it comes to flying these days, there is not a lot of positive. One positive is we are directed to the TSA precheck line at the airport (despite the fact that we have not yet signed up for pre check) but it's a busy Friday night and they are trying to move things along. It's like hitting the TSA jackpot; Congratulations! You've been selected for pre check - you get to preserve your dignity and you can keep your belt, coat, underpants and any metal replacement parts on! As an added bonus you don't have to unpack your private toiletries, (this is my denture cream, preparation H...) or (new this year!) fire up all your electronics. And special tonight- you can even keep your shoes on! Our luck continues, here in the terminal building, it's crowded but we find a couple of those little shoe shine chairs with foot rests to sit in when most of the other flights board leaving just Turkish Air and Emirates to leave after 11 PM. I think it's a bad idea, being comfortable in the terminal so close to a flight in economy; better to have the memory of comfort be a distant thing before boarding. In addition to trying to stow our carry on gear and arrange our travel comfort items, we've got to contend with the rubble of amenities meant to appease any seat discomfort; look there's a pillow! a blanket! (all plastic wrapped and hopefully sanitized) a pair of cozy slippers! a cute bag with lip balm! toothpaste! ear plugs! eye shades! Is there a soul back here in steerage who wouldn't trade it all for a few more inches? "Alex, I'll take 6 more inches of leg room for a toothbrushe and lip balm please"
Poor Jeff- knees to seat! But despite sitting on tenterhooks, no announcement comes. I'm Thankful that the podiatrist or immunologist, or pathologist, or whatever specialty the vacationing doctors have they was able to distinguish between a panic attack and a hear attack, or a leg cramp and a blood clot and not only is everything all right with the patient, but we will make our connection! And look! The guy in the torque is coming down the aisle, asking "pasta or fish"? Maybe there is hope for us in economy after all! Our plane was parked next to this one in the "plane parking lot" that stood in for gates in Istanbul.